As an elementary school teacher, my students are novice learners. Not only are they in the beginning stages of their language learning, but their developmental stage does not allow them the capacity to reach an intermediate mid or advanced low stage. They are not working out travel situations or explaining a broken window to a landlord. 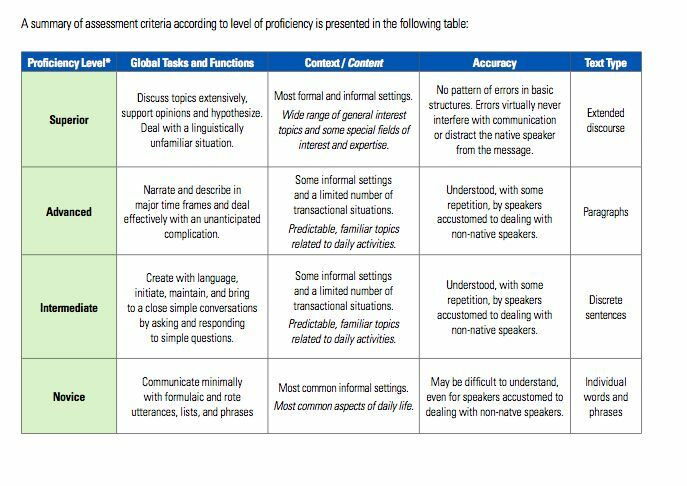 As explained by the chart below, my students are focused on the most common informal communication, in a formulaic and simple conversation. While their proficiency will remain at the novice level for a while, their performance may not. It is important, therefore, to distinguish between performance and proficiency. Performance: Performance is generally demonstrated at the end of a unit to gauge what students are able to do on a certain topic. This topic was the focus over the past weeks or months and the language is rehearsed and planned. There are no real surprises about the language being assessed. Proficiency: Proficiency is what a student can do in any situation on any topic. It is not planned and often requires the speaker to work their way out of a situation and use the skills learned over time to get the message across. Our classroom is based around performance. As such, a students’ performance on any topic covered in class will be higher than his/her overall proficiency. It is not uncommon to have a student reach intermediate low in performance, but to sit at novice mid for proficiency. And that is perfectly acceptable! While I did not explain this to my fourth grader, I did let him know that it would be a while before his Spanish skills matched his English. Despite this fact, I was very clear that he would absolutely be having conversations by the end of this year. While these conversations might not be the same as he might have in English, they would be appropriate and acceptable for how much language learning he had. All of his conversations would be memorized, and I would provide all of the language chunks. His job was simply to practice and use the language. Although he seemed a bit disappointed, I am extremely excited by the prospect of my novice level students conducting conversation in the target language (TL). Check out my next post, for some ideas and activities to make conversation happen in the language classroom.